From Gerry Spence, one of America’s greatest trial attorneys and the New York Times bestselling author of How to Argue and Win Every Time, comes an explosive courtroom thriller of murder, passion, and the twists and treachery of law and justice. Gerry Spence takes readers through shocking twists and suspenseful courtroom scenes that only the great maestro of the courtroom himself could create. Court of Lies goes beyond being a great legal thriller. It questions the very basis of our legal system and its ability to discover the truth and deliver justice. 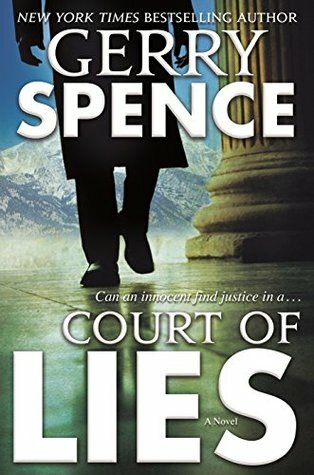 Court of Lies by Gerry Spence is a legal thriller and while I usually love that genre and Gerry Spence is known for them this is still my first attempt at one of his novels. With this first try there were of course things I loved and things I didn’t quite enjoy as much. Court of Lies is centered around the trial of Lillian Adams who has been accused of murdering her wealthy husband. The judge of the trial, Judge John Murray, actually knows the defendant and thinks of her like a daughter. Despite the previous connection though the prosecutor and defense attorney agree to allow the judge to try the case. Now, one thing I find with some legal thrillers is they seem to completely forget the “legal” and courtroom side that I actually do enjoy. Court of Lies however is a lot of courtroom drama during the book which I actually did like. Nothing like those twisted cross examinations and always get a chuckle at the back and forth there. The story also has a lot of twisty back and forth between the characters outside of courst between the characters. However, as much as I wanted to really get immersed into this one personally I found it a little on the dry side and didn’t connect well to the characters leaving it one of those that was just kind of meh instead of intense reads. It definitely had moments that shined but in the end I found this one just an OK read. Gerry Spence court trials are studied in law schools, and he is universally celebrated as one of the greatest courtroom lawyers of our time. He has not lost a jury trial in fifty years and has never lost a criminal or a capital case. His defense of high-profile clients as well as of the poor, the injured, and the damned has won him international renown. His own trials have been the subject of books, film, and television. He received the first Lifetime Achievement Award from the Consumer Attorneys of California and another one from the American Association for Justice. He is the author of the New York Times bestseller How to Argue and Win Every Time. Too bad this one fell short. Nice review Carrie.